Have a long term → vision of the challenges you need to face to realize your ambition – what you need to → learn rather than what you want to do and then have the spirit to face that challenge. To do so, you and your team have to challenge yourselves every day to see if you are achieving your goals. 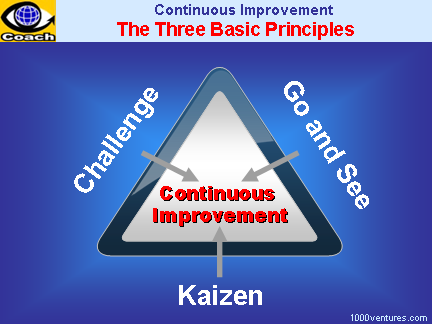 Establishing the → Kaizen Mindset is the starting point of the continuous improvement journey. Everything can and should be improved. Good enough never is, no process can ever be thought perfect, so operations must be improved continuously, striving for evolution and → innovation. This is a key principle of the → Toyota Production System. The only way to truly understand what happens on the shop floor ( 'gemba') is to go there. It is here that value is added and here that waste could be observed. 'Go and See' is therefore a key approach in → problem solving. If the problem exists on the shopfloor then it needs to be understood and solved at the shop floor. Since real value is created at the shop floor in manufacturing, this is where management need to spend their time. Go to the source to see the facts for oneself and make the right decisions, create consensus, and make sure goals are attained at the best possible speed. This → attitude of "Go and See" is also called Gemba attitude. 1. Respect: Taking every stakeholders' problems seriously, and making every effort to build mutual trust. Taking responsibility for other people reaching their objectives. 2. Teamwork: Develop individuals through → teams-based problem-solving. Engage people and develop them through their contribution to team performance. The are three team levels: shop floor teams, the whole site as team, and the whole company as a team. The main purpose of production is to improve the life for everyone and it is this goal that I am dedicated. The → competitor to be feared is one who never bothers about you at all, but goes on making his own business better all the time. We're focused on providing innovations in software, driving the continuous improvement for a much better experience. Average ones compete with others.